Medieval Manuscripts at the University of Notre Dame, Dr. David T. Gura will teach the course and supervise manuscript research. This two-week intensive course will introduce participants to various aspects of Latin Paleography and Western Codicology, offering a balance of theoretical and practical applications. RGG academic director Theodore Cachey commented that: “This program is the product of the Univerisity collaborations with two of our most important partner institutions in Rome, the Biblioteca Apostolica Vaticana and the American Academy in Rome”. “Personally, I think this is a great example of collaboration between the American Academy, the Biblioteca Apostolica Vaticana, and the University of Notre Dame” says Gura, "it is particularly a great way for researchers and students from both Notre Dame and abroad to experience the holdings of one of the best libraries in the world. The combination of classroom seminars at the AAR and RGG are augmented by practical sessions in the BAV, where participants will work with medieval manuscripts and apply the skills they are developing in the course." In fact, participants will develop mastery of abbreviation systems, the ability to identify, classify, localize, and date western book hands (ca. 1100-1500), and an understanding of the historical development and influence of Latin scripts. Western codicological principles and an introduction to analytical manuscript description will enable participants to interpret the manuscript as a complete object by utilizing physical properties such as collation, ruling patterns, decoration in parallel with the script. 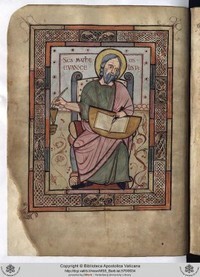 A special feature of the course will be research visits in the BAV, which will enable participants to apply the skills and techniques learned in seminars with medieval manuscripts in situ. Discussion sections will offer a chance for students to share their experiences in a group setting and discuss various problems and difficulties. Originally published by Costanza Montanari at international.nd.edu on April 03, 2017.